« MacVector, Assembler and network licensing. The default settings for Primer3 do not actually check for whether a primer will bind at multiple places in the template. 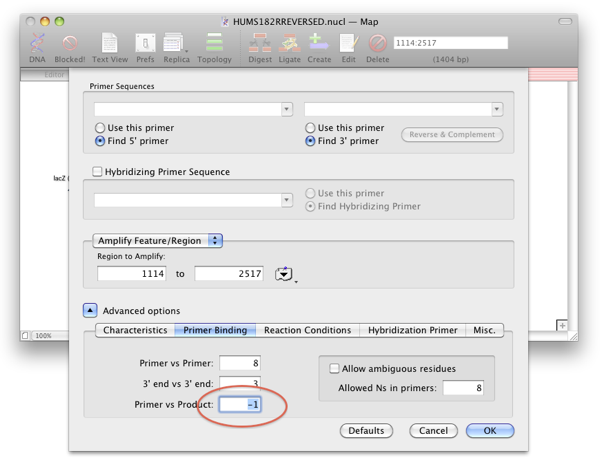 To turn this on use the PRIMER vs PRODUCT setting in the PRIMER BINDING tab (the Primer3 parameter is “PRIMER_MAX_TEMPLATE_MISPRIMING”). The default value is -1, which means do not check. Change this to 1 to start checking, or increase the number to increase stringency. This should now find any duplicate alignments. Incidentally an upcoming release will have a special “QuickPrimer” tool for checking such issues as well as the Primer3 tool. This entry was posted in Tips and tagged primer3. Bookmark the permalink. Both comments and trackbacks are currently closed.